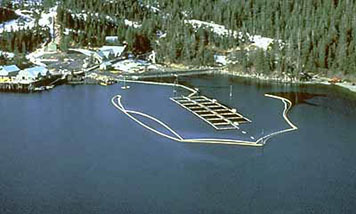 Boom surrounds a set of floating net pens at a salmon hatchery in Prince William Sound, Alaska, to protect the pens from oil spilled from the Exxon Valdez. During a spill response, sensitive locations threatened by an advancing oil slick can be protected with various kinds of equipment and tactics. Across a narrow entrance to the ocean, such as a stream outlet or small inlet, to close off that entrance so that oil can't pass through into marshland or other sensitive habitat. In places where the boom can deflect oil away from sensitive locations, such as shellfish beds or beaches used by piping plovers as nesting habitat. Around a sensitive site, to prevent oil from reaching it. Hard boom is like a floating piece of plastic that has a cylindrical float at the top and is weighted at the bottom so that it has a "skirt" under the water. If the currents or winds are not too strong, booms can also be used to make the oil go in a different direction (this is called "deflection booming"). Sorbent boom looks like a long sausage made out of a material that absorbs oil. If you were to take the inside of a disposable diaper out and roll it into strips, it would act much like a sorbent boom. Sorbent booms don't have the "skirt" that hard booms have, so they can't contain oil for very long. Fire boom is not used very much. It looks like metal plates with a floating metal cylinder at the top and thin metal plates that make the "skirt" in the water. This type of boom is made to contain oil long enough that it can be lit on fire and burned up. Skimmers are boats and other devices that can remove oil from the sea surface before it reaches sensitive areas along a coastline. 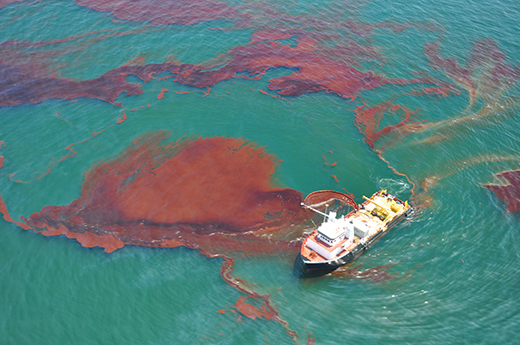 In the photo below, oil is being skimmed from the sea surface by a "vessel of opportunity." Sometimes, two boats will tow a collection boom, allowing oil to concentrate within the boom, where it is then picked up by a skimmer. 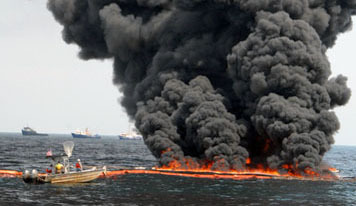 In situ burning of an oil slick, or part of a slick, before it reaches the coast. To do this, responders corral some of the oil from the slick in a fire-proof boom, then ignite it (as has been done in the photo to the right). This technique works best when the oil is fresh and the weather relatively calm. Using aircraft or boats to apply dispersants (chemicals that disperse the oil into the water column, so that much less stays at the surface, where it could affect beaches and tideflats). Spill response experts know that all of these methods are effective only when conditions are conducive to using them. In Situ Burning: When conducted properly, in situ burning significantly reduces the amount of oil on the water and minimizes the adverse effect of oil on the environment. Response Techniques Photo Gallery: View photographs of a variety of ways first responders contain and clean up oil spills. Mechanical Protection Guidelines [PDF, 996.4 KB]: A 1994 manual describing how to deploy booms, barriers, and other mechanical protection devices during a spill response. FAQ: Microbes and Oil Spills: This report is based on the deliberations of over 20 of the nation’s leading experts who came together for one day to develop clear answers to seven frequently asked questions regarding the role of microbes in an oil spill.